Some interesting things happened on the way to the Mets 1-0 victory over the Atlanta Braves on Thursday. 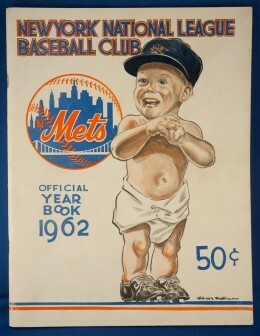 It was the Mets’ 50th opening day in their franchise’s history. When it was over they had won their 33rd opening day game. A lot has happened since 1962, their inaugural season. One of the records that they set that year has never been broken. They finished the season breaking the record held since 1899, 40-120; last in the National League, 60 1/2 games behind the NL Champion San Francisco Giants. But Thursday’s game was a good old fashion pitcher’s duel between Johan Santana and Tommy Hanson. (Roger Craig was the Mets opening day pitcher 50 years ago). Santana, who hadn’t thrown in a regular season game in 19 months, was spot on through the five innings he pitched, giving up just two hits, no runs, and striking out five. Ike Davis was at 1B and David Wright at 3B. In 1962, (Don Zimmer played 3B and Gil Hodgers was over at first). 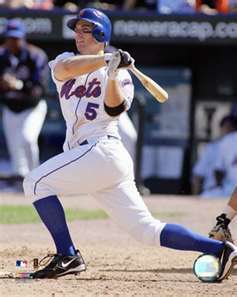 David Wright’s RBI single won the game 1-0 while in 1962 the Mets got rocked by the St. Louis Cardinals 11-4. Thursday’s win was the best part of the opening day game. Unfortunately, CF Andres Torres re-injured his left calf and left the game and is now headed for the disabled list. The Mets are not stacked at that position and it will be left for either Scott Hairston or Mike Baxter to patrol. So sadly, even in victory, they suffered a loss. The pundits have the N.Y. Mets finishing no better than last in the N.L. East this season so without any pressure on them, maybe they will prove them wrong and put up a better showing. Clearly, if Johan Santana continues to pitch like he did today and stays injury free, their chances will be that much better. Meantime, Happy 50th Anniversary to the ‘Amazin’s! I was touched by the Gary Carter tribute at the beginning of the game. His family members throwing out the first pitch was simply a great moment. Yeah that was nice that they acknowledged ‘The Kid’. Very emotional. A tragedy that he passed at such a young age (57).